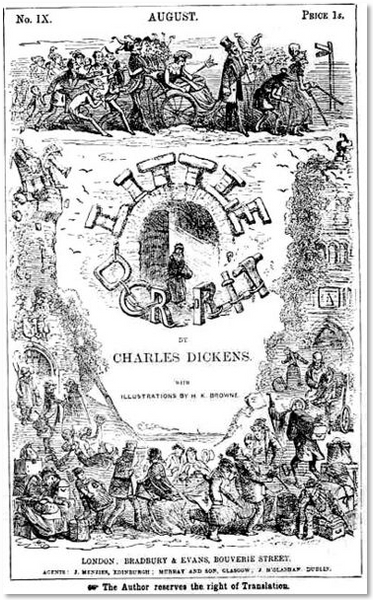 This page presents a summary of the plot and characters of Little Dorrit, a novel of social criticism by Charles Dickens. Little Dorrit is a book by Charles Dickens published in serial instalments between 1855 and 1857. William Dorrit is a distinguished gentleman but an incompetent businessman. He falls into debt and because he is unable to pay his creditors, is confined to the Marshalsea, a debtor's prison in London. In accordance with the law at the time, Dorrit's family - his wife and two children, the snobbish Fanny and lazy Tip - are allowed to accompany him to the jail and share his cell. Later, the Dorrits have a daughter, Amy, who is born in prison. Amy is referred to as Little Dorrit because of her size and youth. 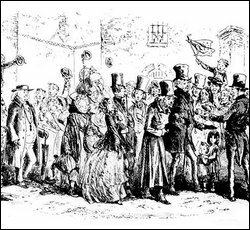 Little Dorrit is doted on by the other inmates of the jail as well as the jail's warden. When Little Dorrit is eight years old, her mother dies. A few years later Mrs. Bangham, who had helped deliver Little Dorrit when she was born, and the jailer, who had formed a special bond with Little Dorrit also die. Upon the warden's death, William Dorrit becomes the dean of the prison and is referred to as the "Father of the Marshalsea" while Little Dorrit, now 16 years old, is referred to as the "Daughter of the Marshalsea". Little Dorrit dutifully supports her family with the money she earns by sewing. The lives of the Dorrits are intertwined in a mysterious way with the Clennam family. Arthur Clennam, who is in his forties, has just returned to London after being to the Orient on family business. His own father has died the year before, and Clennam has come back to see his mother. Shortly before his death, Arthur Clennam's father had given his son a watch with a piece of silk paper inside, with the letters D.N.F on it which stood for "Do Not Forget". Thinking that the watch was intended for his mother, Arthur has it shipped back home to his mother from China. However, his mother angrily refuses to discuss the meaning of the watch or the note. On his return to Europe, Arthur docks at the French port of Marseilles and is quarantined with a number of other passengers. Here Arthur meets Miss Wade, a husband and wife by the last name of Meagles and their daughter "Pet", and Tattycorum, an orphan that they have adopted and who works as their servant. Eventually Arthur returns to London with the intention of telling his mother that he has left the firm, but he is oppressed by the feeling that there his family is guilty of something (perhaps an unpaid debt) and that there is a mystery at the heart of the relationship between his parents. Little Dorrit helps her siblings to find work and leave the jail, while she herself finds work as a domestic in the home of Arthur's mother, Mrs. Clennam, where Arthur meets her for the first time. Little Dorrit is now 22 years old. Arthur finds Little Dorrit attractive and when she returns to her home at the Marshalsea jail, where she still lives with her father, he decides to follow her. It is then that Arthur realizes the extreme poverty in which she lives and he decides to be her protector. Little Dorrit falls in love with Arthur but she is far too shy and feels too inferior socially to reveal her true feelings. Meanwhile Little Dorrit does not realize that the son of the Marshalsea jail warden is in love with her. Arthur makes enquiries about the Dorrit family. He asks Little Dorrit if she had ever heard the name Clennam before going to work for his mother, but she replies that she had not. However Arthur suspects that there is in fact a connection between his family and the Dorrits and he suspects that his mother may have had something to do with the Dorrits' downfall. In an attempt to unravel the mystery Arthur turns to Titus Barnacle for information about the nature of William Dorrit's debt. Barnacle is a bureaucrat in the slow moving government ministry called the Circumlocution Office, where papers are pushed on and on, with nothing ever done. Barnacle and his Circumlocution Office are an allegory about government waste and inefficiency. While at the Circumlocution Office Arthur meets Mr. Meagles again and an inventor named Daniel Doyce, with whom he enters into a business partnership. With the help of a tireless debt collector named Panck, Arthur finally discovers that William Dorrit is the heir to a large fortune. The Dorrits are now rich and William Dorrit is able to pay off his debts and leave the debtors' prison for the first time in decades. Suddenly wealthy and respectable again, Mr. Dorrit decides to take his family on a holiday to Europe. Mr. Dorrit and his children, except for Little Dorrit, take on snobbish airs. 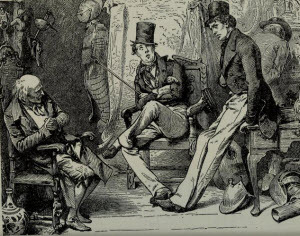 Mr. Dorrit begins to frequently criticize Little Dorrit, who had once been his favorite child, for not having good social graces and not fitting in to the high society in which they are now mingling. Little Dorrit's father also begins scheming to marry her off to someone of high society, much to the dismay of Little Dorrit who is in love with Arthur. This period ends with the death of Little Dorrit's father. Little Dorrit then goes to live with her now married older sister and her foppish husband, Edmund Sparkler. However the Dorrit family fortune is suddenly lost again when her sister's husband lose everything in a fraudulent investment scheme run by Edmund's father and an accomplice. This financial collapse also ruins Arthur, and the Dorrits and Arthur are now all imprisoned for debt in the Marshalsea prison. Meanwhile a French villain on the run from the law, discovers that Arthur is not really Mrs. Clennam's son. It turns out that Arthur was the love child of his father and a beautiful singer. Arthur's father had given up his true love and married Arthur's step mother because of pressure from his wealthy uncle. The child had been raised as their own. 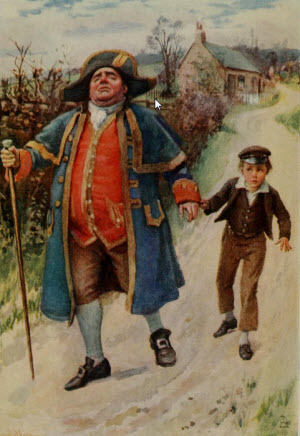 The uncle was consumed by guilt for having broken up the relationship between Arthur's father and his biological mother, and to assuage his guilt he had left his estate to the Arthur's biological mother and "the youngest daughter of her patron," a musician who happened to be Little Dorrit's now deceased uncle. Because Little Dorrit's uncle had no children, the inheritance now belongs to her. Mrs. Clennam confesses to Little Dorrit that she has hidden this secret from her and from Arthur and begs for forgiveness. Mrs. Clennam then collapses out of her wheel chair and in a somewhat ridiculous scene reminiscent of Poe's Fall of the House of Usher, the house begins to fall down around her, killing the would be blackmailer Rigaud. It is indeed the fall of the house of Clennam. Little Dorrit decides not to tell Arthur because she knows that he will be crushed to learn the truth about his mother. As a result, she passes up the opportunity to claim her inheritance. But in yet another melodramatic and improbable plot twist all ends well anyway. Arthur's business partner returns from Turkey a rich man and Arthur is released from jail. Little Dorrit and Arthur then get married and live happily ever after, which might not have been a very long time given the short life expectancies of Victorian England and the twenty year age difference between them. 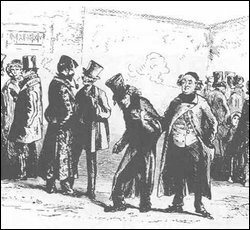 As is typical of Dickens' novels, Little Dorrit has many subplots involving minor characters. One subplot involves Mr. and Mrs. Meagles, whom Arthur had first met at Marseilles in the company of Miss Wade and their daughter Pet as well as their foster daughter and servant Tattycorum. Pet marries an artist named Gowan, while Tattycorum is lured away by Miss Wade a sinister man-hating character who is an accomplice of the criminal Rigaud. Miss Wade's hatred for men turns out to be due to the fact that she was once jilted by Gowan, the same man that Pet married. In some ways these subplots are filler meant to create a rich landscape of characters and incidents. 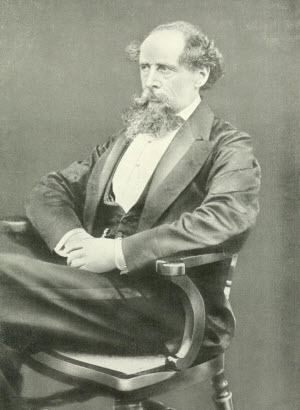 And while one must admire Dickens's ability to create memorable characters, even when they have a minor role in the novel, the intertwining of their lives is unrealistic and improbable.